I’m new to this machine, I’ve been running it about 3 weeks now. I’ve been to a few spots that I have hit (well I thought) that I hunted out and hit hard with my Ace400. I have found a lot of stuff that I missed with my Garrett, running them side by side on the same target my Garrett would be getting iron hits, but the V3i knew there was something good there. This machine is very impressive with being able to reject iron targets around a good target, like insanely good. I’ve done a few tests with the stock coil with coins and iron in the same hole at different depths/side by side/coin on end and pretty much all the results would have been a diggers if I was out on a real hunt. I was very impressed. Now I buried a quarter at 12 inches and it can hit it, but sometimes from only 1 direction, but it knows it’s a quarter, I think it would hit better on undisturbed soil. I plan on redoing a quarter depth test with my new Detech ultimate 13 Coil, and some updated settings since I am learning more about this machine as I use it. It’s really not as complicated of a machine as people say. You just have to spend time using it to find the settings that work best for you to get the fullest potential in areas you are hunting. Found my first mercury dime with it at a trashy school that has been hit hard over the years. Not saying this is the best machine out there but it’s all I will ever need. My experience is that the v3i has a steep learning curve. The manual isn’t real clear and needs to be updated. I’m fairly smart with a Master’s degree. 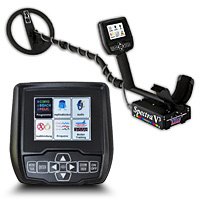 The V3i is a great detector, it has everything you would ever need in a metal detector, "beginner or seasoned pro"! It's just a bit heavy at 4.5 lbs. After 30 minute of swinging it back and forth my arm was ready to fall off. I have had many metal detectors over the years. I've had Fisher, Minelab, Tesoro and White's. My newest detector is the White's V3i and it is so far the best detector I have owned. The V3i is not for those new to metal detecting. It is a bit complicated and for those who cannot figure out how to use your TV remote control, then find an easier detector to buy. For those who are comfortable with menus and computers, the V3i is by far the best detector for most all conditions. It is the most adjustable detector on the market so far as of 2015. I can hunt in areas that some of the other detectors I have owned could never even get near. EMI (electromagnetic interference) is easily defeated with the adjustment of frequencies and offsets. Ground tracking can be adjusted to almost all conditions. I have incorporated wireless headphones and lithium ion 3100 mah battery and it is right now a perfect metal detecting machine for me. You just cannot find a more adjustable detector today. It is complicated and takes some time to learn. If you take your time and learn it, it will find you things that others will never be able to get to. My wife bought me a V3i for Christmas. In my opinion, it is by far the best top of line detector out there. I have owned a Fisher Coin Strike, Tesoro Cortes, Garrett GTI 2500, Minelab Explorer XS. The Fisher always mixed pull tabs amongst the nickel signals but had decent depth. The Tesoro was good on nickels and was also decent on depth. The Garrett was way too heavy, was decent on nickels but I never dug anything past the 7-8 inch range. The Minelab had excellent depth but literally fell apart while using it. This machine was sent in 4 times to fix-broken coil ears twice and shaft breaking out of the control housing twice. I found 2 gold rings in trashy parks with the Cortes and 1 gold ring with the Garret in the same type of park. The V3i literally hammers the nickel/gold ring range of signals I have found 1 gold ring and a gold/diamond ring in a trashy park with the V3i. The old timers keep telling me its hunted out and I know the park has been literally pounded by every detector made for years. I have found numerous silver dimes in the same park in the 9-10inch range. I have found dozens of old nickels in the 7-9inch range in the same park. I keep hunting the same place as others have given up. I've been metal detecting for over 25 years, I have had many detectors over the years and found a ton of jewelry, thousands of dollars in coins, the best detector I ever had is the White' XLT which I still use, although the screen no longer lights up, I know it so well is not necessary for me to look at it. I'm scouting for a new detector and I'm sold out on the White's V3i, my experience with my XLT is so great that I don't care if I throw my money away, hell my XLT paid for it self 100's of times .. LOL! From Puerto Rico Orlando Roman. Yes, it takes a bit of effort to learn this machine but, once you figure out the settings and how they react, you will be rewarded well. For those complaining about price, it is on par with other top end detectors. You get what you pay for. Good luck with your ace 250's. 9" us quarter depth with 10"dd stock coil, custom program, strong mineralization / somewhat high emi environment. I purchased my V3i one year ago and it paid for itself in the first couple of months! It is a monster at finding silver. It is a little pricy but if you want to play....You gotta pay. I got my new V3i out for the first time today. I had a v3 when they first came out, I liked it But, the new V3i was smoother and really seemed to work great. Spent an about 90 min in coin and jewelry mode at an old ballfield that had been hunted hard. I came out with 9 Quarters, 9 dimes, 3 nickels, 5 pennies. One of the Dimes was a 1957 Silver that was about six inches down, and only dug 3 junk items. I was REALLY happy with it. Only reason I quit hunting was it started snowing hard and getting colder. can't wait to get back out. This detector is the best I have ever owned and yes I have had owned other supposedly high end detectors costing more then the V3i. Just be careful when you watch youtube videos and read reviews. I’m not writing this review to sell you this detector but to give you my knowledge and experience with this detector. The V3i is a high tech user friendly detector that was designed for you, “the user” giving you the availability to tweak this machine to best work in your environment, i. e. mineralization, EMI, hot rocks etc. but not excluding personal tweak options like screen color, live on the fly menus etc. I have not found a detector that offers such versatility as that of the V3i. I have paid more for competitor detectors thanks to youtube and other resources that made me think, “the competitor’s detector is better then the one I just purchased”, again be careful. I paid $2500 for a detector that had a 100 different frequencies even went under water and lost money when I sold it. Live controls you can adjust on the fly, Discrimination, Sensitivity, Tracking, Gain and Programs just to name a few. Probe, see for yourself the signal percent from the ground and the Noise percent returning from the ground and Ground Probe, see for yourself the severity of your ground, analyze VDI, phase and target strength etc. Ground Filters your can set for your ground mineralization. Ground Tracking, see for yourself when ground mineralization effects change. I love this, one or three different frequencies, see for yourself the three frequencies analyzing your target or just use one frequency if you want. This machine has an analyzer, just flip your toggle switch forward. You also have on board menu’s to help you if your not understanding a particular feature. I could go on and on noting the features this machine has and I have only just touched a few features. If this machine seems overwhelming at first then just use the factory preset programs to start off with, you’ll still get lots of finds, learn it, and you’ll go deep once you tweak it for your area conditions and who knows, the factory presets may work fine in your area, for me, my mineralization is low so I dropped my ground filter to 5. 0 Hz Band Pass, upped my RX Gain to 13 and detected a dime at 12”. Others will argue but I just consider them cry babies who wants to be spoon feed so they buy a detector will little or no tweak options. As you have probably already determined, I love my V3i and I feel there is no machine that can touch it for the price. But please keep in mind you can’t be lazy with this machine if you want to use it to it’s fullest potential. My advise to anyone is, if you want a detector worth the money then consider the V3i. Everyone needs a good understanding what Sensitivity, Discrimination, Gain, Mineralization, Hot Rocks etc. is about. You also need to have some understanding of what metal conductivity is, different metal alloys and so on, and how they react to a metal detector, coins, jewelry etc. or you’ll never be happy with what you purchase. Last but not least, consider the manufacture, do they stand behind their product, do they respond to your emails etc. White’s is Number 1 and they are USA made. Also down the manual and read it first, and buy from a local dealer if you can. Best wishes and good hunting.